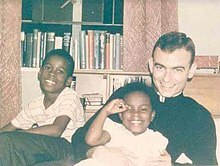 Jonathan Myrick Daniels (March 20, 1939 – August 20, 1965) was an Episcopal seminarian and civil rights activist. In 1965, he was murdered by a shotgun-wielding construction worker, Tom Coleman, who was a special county deputy, in Hayneville, Alabama, while in the act of shielding 17-year-old Ruby Sales. He saved the life of the young black civil rights activist. They both were working in the civil rights movement in Lowndes County to integrate public places and register black voters after passage of the Voting Rights Act that summer. Daniels' death generated further support for the civil rights movement. In March 1965, Daniels answered the call of Dr. Martin Luther King Jr., who recruited students and clergy to join the movement in Selma, Alabama, to take part in the march for voting rights from Selma to the state capital of Montgomery. Daniels and several other seminary students left for Alabama on Thursday, intending to stay the weekend. After Daniels and friend Judith Upham missed the bus home, they had second thoughts about their short stay. The two returned to the seminary just long enough to request permission to spend the rest of the semester working in Selma, where they would also study on their own and return at the end of the term to take exams. In Selma, Daniels stayed with the Wests, a local African-American family. During the next months, Daniels worked to integrate the local Episcopal church by taking groups of young African Americans to the church. The church members were not welcoming. In May, Daniels returned to the seminary to take his semester exams and passed. Daniels returned to Alabama in July to continue his work. He helped assemble a list of federal, state, and local agencies that could provide assistance for those in need. He also tutored children, helped poor locals apply for aid, and worked to register voters. That summer, on August 2, 1965, Congress passed the Voting Rights Act which would provide broad federal oversight and enforcement of the constitutional right to vote. Before that, blacks had been effectively disenfranchised across the South since the turn of the century. On August 14, 1965, Daniels was one of a group of 29 protesters, including members of the Student Nonviolent Coordinating Committee (SNCC), who went to Fort Deposit, Alabama, to picket its whites-only stores. All of the protesters were arrested. They were transported in a garbage truck and taken to jail in the nearby town of Hayneville. The police released five juvenile protesters the next day. The rest of the group was held for six days in a facility which lacked air conditioning. Authorities refused to accept bail for anyone unless everyone was bailed. Upon learning of Daniels' murder, Martin Luther King Jr. stated that "one of the most heroic Christian deeds of which I have heard in my entire ministry was performed by Jonathan Daniels." A grand jury indicted Coleman for manslaughter. Richmond Flowers Sr., the Attorney General of Alabama, believed the charge should have been murder and intervened in the prosecution, but was thwarted by the trial judge. He refused to wait until Morrisroe had recovered enough to testify and removed Flowers from the case. Coleman claimed self-defense, although Morrisroe and the others were unarmed, and was acquitted of manslaughter charges by an all-white jury. (Disfranchisement had resulted in excluding blacks from jury duty, as only voters were called.) Flowers described the verdict as representing the "democratic process going down the drain of irrationality, bigotry and improper law enforcement." Ruby Sales went on to attend Episcopal Theological School (now Episcopal Divinity School). She works as a human rights advocate in Washington, D.C., and founded an inner-city mission dedicated to Daniels. The Virginia Military Institute created the Jonathan Daniels Humanitarian Award in 1998; awardees include former President Jimmy Carter. Daniels is one of 40 martyrs memorialized at the Southern Poverty Law Center's Civil Rights Memorial in Montgomery, Alabama. A play by Lowell Williams, Six Nights in the Black Belt, chronicles events related to the arrests in Fort Deposit, six nights in jail, and Daniels' murder. It also explores the relationship between Daniels and Stokely Carmichael, then a member of the Student Nonviolent Coordinating Committee, with whom he shared a jail cell in Hayneville. ^ 4:32 PM ET (2015-08-20). "50 Years Ago, A White Seminarian Gave His Life to the Civil Rights Movement". NPR. Retrieved 2017-01-13. ^ a b "Remembering Jonathan Daniels: Part 2". The Keene Sentinel. August 12, 2005. Retrieved March 23, 2008. ^ Sanborn, Karen, "Remembering Jonathan Daniels: Part 1", The Keene Sentinel, August 11, 2005. ^ "Jonathan Daniels · The Archives of the Episcopal Church · The Church Awakens: African Americans and the Struggle for Justice". episcopalarchives.org. Retrieved 2018-08-15. ^ "Jonathan Myrick Daniels (VMI Class of 1961) Civil Rights Hero". Virginia Military Institute. Retrieved February 1, 2015. ^ a b "Leadership Gallery: Jonathan Daniels, 1939–1965", The Archives of the Episcopal Church. ^ "Life of John Daniels" Archived 2009-10-14 at the Wayback Machine, Keene Schools material. ^ The Garden of Gethsemani from Flickr. ^ Episcopal News Service, Retrieved November 23, 2013. ^ "Washington National Cathedral". Cathedral.org. Retrieved 2017-01-13. ^ "Here Am I, Send Me: The Journey of Jonathan Daniels - TV Guide". TVGuide.com. Retrieved 15 October 2018. ^ "Here Am I, Send Me: The Story of Jonathan Daniels". Vimeo. Retrieved 15 October 2018. Daniels, Jonathan Myrick (1992) . Schneider, William J. (ed.). American Martyr: The Jon Daniels Story. Harrisburg, PA: Morehouse Publishing. ISBN 978-0819215864. Originally published as The Jon Daniels Story: with his Letters and Papers (New York: Seabury Press, 1967).